WHAT: The University of Illinois Springfield Engaged Citizenship Common Experience (ECCE) Speakers Series presents a screening of A Girl Like Her. The film explores how during the 1950s and 60s millions of young women were banished to maternity homes to give birth, surrender their children, and return home alone. A discussion led by Ann Fessler, the film’s director, will follow the screening. WHEN: Thursday, March 21, 2013 at 7 p.m. DETAILS: At a time when “nice girls” didn’t get pregnant, women were expelled from high schools and colleges and forced to leave jobs as teachers and nurses before their indiscretion was apparent to others. They were rendered voiceless and invisible—banished to the towns of distant relatives or maternity homes to give birth and surrender their children. 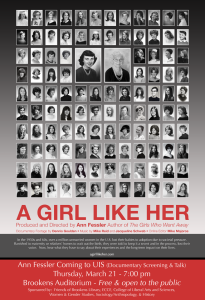 For the past 30 years, Ann Fessler has focused on the stories of women and the impact that myths, stereotypes, and mass media images have on their lives and intimate relationships. Between 2002-2005, Fessler conducted over 100 interviews with women who lost children to adoption during the 28 years that followed World War II, when a perfect storm of circumstances led to an unprecedented number of surrenders. Her book, The Girls Who Went Away (Penguin Press, 2006) was chosen as one of the top 5 non-fiction books of 2006 by the National Book Critics Circle, and was awarded the Ballard Book Prize, given annually to a female author who advances the dialogue about women’s rights. This event is co-sponsored by the Friends of Brookens Library, UIS College of Liberal Arts and Sciences, Women & Gender Studies, & History.